Which are the best Las Vegas buffets? While opinions vary widely, I decided to create a list of all the buffets considered "best" by many reviewers. 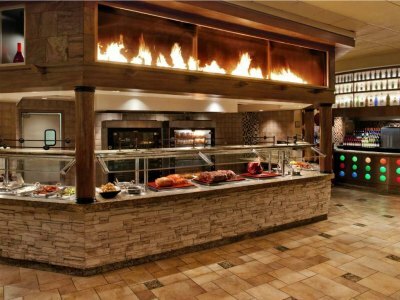 Buffets is one of the most popular options to eat in Vegas, therefore many of the dining facilities listed below participate in the Total Rewards Buffet of Buffets . 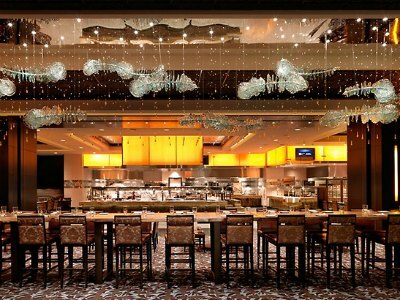 Buffet of buffets is a special deal - two 24-hour passes to any 7 mouthwatering best Las Vegas buffets: Bacchanal at Caesars Palace, Spice Market Buffet at Planet Hollywood, Le Village at Paris Las Vegas, Paradise Garden at Flamingo, Carnival World and Village Seafood Buffet at The Rio, Flavors at Harrahs'. start using your pass in the evening for a very late dinner - this way you will be able to eat throughout the entire next day, including another dinner. You can get buffet of buffets deal by booking 2 nights in any one of the participating Las Vegas hotels. Review: Bacchanal Buffet is a new place, but already received so many positive reviews that I can easily include it in the list of the best Las Vegas buffets. 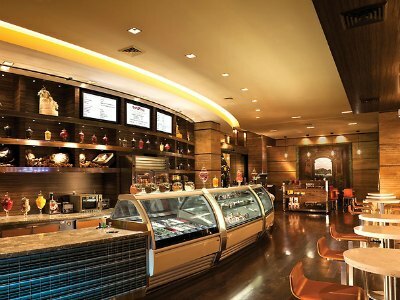 Bacchanal Buffet is huge in terms of space and the number of delectable dishes. The buffet offers about 500 items by the most popular cuisines - Mexican, Italian, French, etc. The selection of desserts is so good that no one will be surprised if you skip the main course! 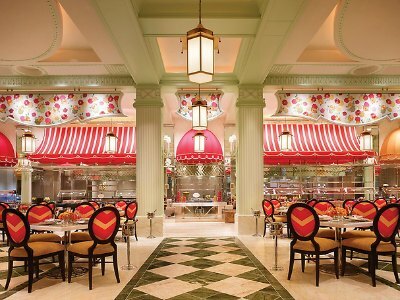 Review: Next in our list of the best Las Vegas buffets is Carnival World located at Rio Hotel. Less hyped about and less pricey than the buffets at Wynn and Bellagio, Carnival World offers everything you are looking in a buffet. This place is especially valuable for seafood lovers, although it does offer a variety of meats, and yummy sweet delicacies are nicely arranged at a dessert station in the middle of the buffet. Review: although Wynn Buffet carries less items than, let's say, Bacchanal, many agree that it's the quality over quantity that makes it one of the best Las Vegas buffets. Pretty flowery design complements the delicious food, served by 16 stations. Most of the popular world cuisines are present here. Among people's favorites are fresh seafood including crab legs and shrimp, risotto, eggs benedict and ribs. Review: The Buffet at Bellagio offers everything you are looking for in the best Las Vegas buffets: a variety of dishes represented by the most popular cuisines, including Italian, American and Asian. The buffet offers plenty of meat (a great carving section with Turkey, ribs, lamb chops), as well as on seafood (crab legs - yum!). If you add a few extra bucks, they offer an unlimited champagne option - I wouldn't want to miss out on that! Review: With the most common complaint being that crab legs here are cold, most of the reviewers agree that Wicked Spoon tops the list of the best Las Vegas buffets. Wicked Spoon offers all the more popular cuisines of the word: Chinese, French, Italian Japanese and many others. The buffet offers a great selection of desserts, especially chocolates. Many reviewers praised Breakfast (or Brunch - from 8:00 am to 2:00 pm). Wicked Spoon Buffet offers happy hour from 5:00pm to 7:00pm when you can get beers or cocktails at the price of $5. 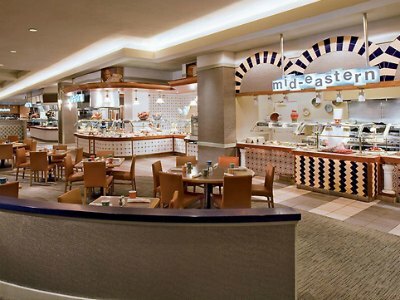 The Spice Market Buffet at the Planet Hollywood is a fantastic place to gorge on delicious cuisine from around the world and is the only best Las Vegas buffet that offers a multitude of Middle Eastern delicacies. You can also indulge in other mouthwatering dishes from regions of the world such as Italian, Asian, Mexican and the Americas. The options are endless for your taste buds that will be dancing with joy from the main course to the fabulous choices you have for dessert. When you want to surprise your stomach with great food, then you need to try the Spice Market Buffet at the Planet Hollywood Hotel. 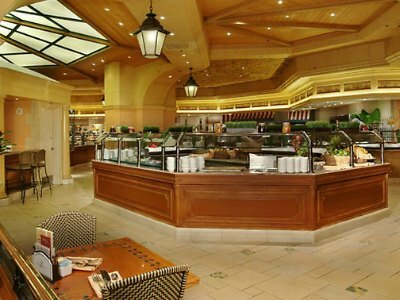 You can experience the best of French cuisine when you dine at the Le Village Buffet. You will be delighted with your choice as you dine on dishes from five distinct provinces of France in an atmosphere that transports you to several small villages in France where you can indulge in specialties from Burgundy, Provence, Alsace and more. Maybe the most impressive food station at the Le Village Las Vegas buffet is from Brittany where you can have crepes made-to-order with a variety of great flavored ingredients. Breads and cheese from France with have your eyes popping and the desserts are second to none. 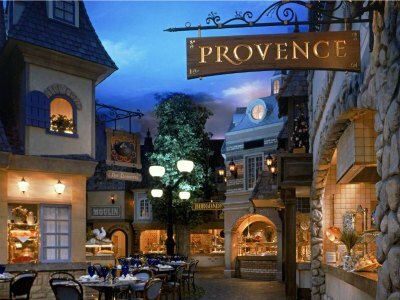 When you are to dine like a French king then you must try the Le Village Buffet at the Paris Hotel. You will be delighted with the picturesque scenery of waterfalls at the Paradise Garden Buffet at the Flamingo Hotel and the cuisine will knock your socks off. You can indulge in specialties that include tasty treats influenced by Cajun, Southern, Mexican and traditional American dishes. Feast on freshly made brick oven pizza, waffles made-to-order, roasted prime rib as well as peel and eat shrimp. Paradis Garden Las Vegas buffet will please everyone in your group no matter what time of day you arrive. 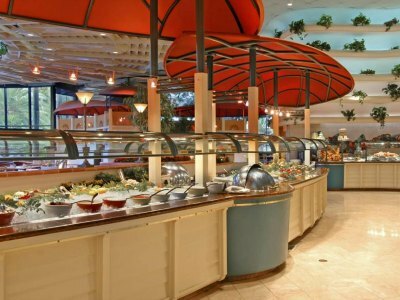 From a fresh salad bar to yogurt station your stomach will be satisfied with the wonderful flavors from around the world when you visit the Paradise Garden Buffet at the Flamingo Hotel. The Flavors Buffet at Harrah’s will have you jumping for joy when you enter and see all the incredible cuisine from around the world. You can feast on dishes that are freshly prepared like hand-rolled sushi, a multitude of Italian dishes and even an excellent carving station of Brazilian Barbeque known as Churrasco. 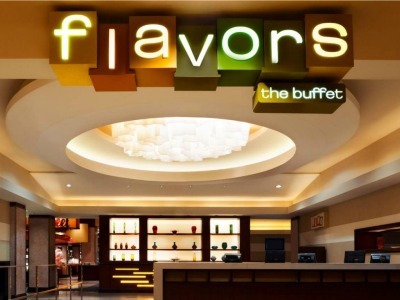 Flavors Las Vegas buffet does not stop there with all-you-can-eat crab legs on selected nights, several live cooking stations as well as Southwestern cuisine which will melt in your mouth. When you need to treat your taste buds to something fabulous from appetizers to innovative main courses to exquisite desserts then Flavors Buffer at Harrah’s is right up your alley. Review: Where you can eat all day for $24 or have a Champagne Breakfast for $8.99? 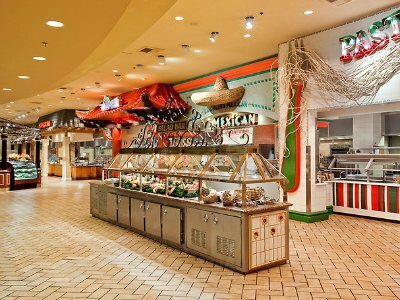 Head out to French Market Buffet at Orleans Hotel & Casino, one of the best Las Vegas buffet with unbeatably prices. Food here represents most of the popular cuisines, including Italian, Mexican, Asian. Reviewers praise their Lasagna, bbq, ribs, rotisserie chicken, and mussels. 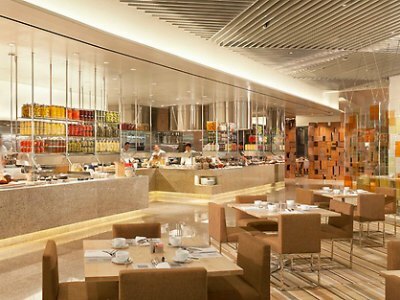 Review: If you don't mind traveling a bit, try Studio B buffet, located inside M Resort. Although quite far from the Strip, many reviewers swear that it's one of the best Las Vegas buffets. A few things stand out at this place: free beer and wine and seafood brunch and dinner starting on Friday at 4:00 pm and continuing throughout Saturday and Sunday. Another great addition is that items on the menu include more rare cuisines such as Indian and Thai. Review: When talking about the best Las Vegas buffets, we simply cannot ignore Bally's Sterling Brunch. This delightful buffet only works on Sundays and only for Brunch. It turns into a regular, albeit upscale steakhouse on other days. Price wise, Bally's Sterling Brunch is on the high end, but many reviewers swear by the quality of the food and the value of the Brunch here. The restaurant has an "Old Vegas" look and feel with it's classy decor. As you come in to the restaurant and wait for your table, they will greet you with Bloody Mary. The Brunch itself is a scrumptious feast of various meats and seafood. If you want to treat yourself to something special on a special occasion - that could be just the place. 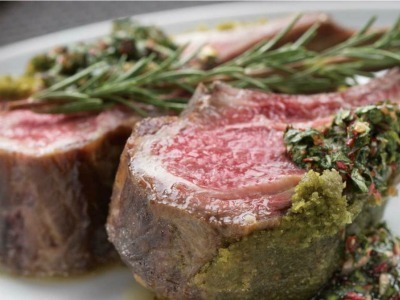 Review: I bet you are wondering what are the best Las Vegas buffets that serve the best meat in town? 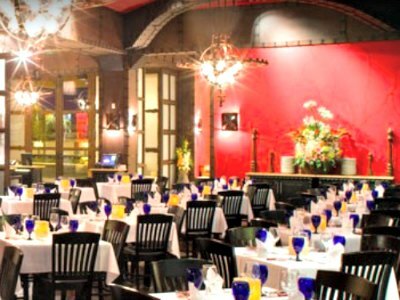 Meat-lovers, rejoice - I found a place that is just perfect for you - Texas de Brazil! Although not quite a buffet in the meaning most people understand the word, the restaurant is all-you-can-eat. They use a "continuous service" where you simply sit at your table and enjoy sampling of meats that just keep coming and coming to you. All kinds of meats - chicken, ribs, lamb and everything you can imagine, prepared according to the best Brazilian traditions. By the way, if you have a vegetarian in your company, Texas de Brazil also offers a huge selection of salads - around 50 items.